There are several package enhancements to choose from. Add one or all to your birthday package to make it even better! The most popular package enhancement we offer is the Face And Body Temporary Airbrush Tattoos. It is the latest thing in High End Face Painting, Body Art and Temporary Tattoos. Airbrush art is also faster than paint brushes so can accommodate a larger number of people in less time. Not only the children enjoy the fun selections of temporary airbrush tattoos, the adults like to plunge into their fantasies too! Best of all, we use the water based, hypoallergenic makeup paint that washes off with soap and water. Add this fun enhancement at the beginning of your event while the guests arrive. You may add the option of loot bags to any package. 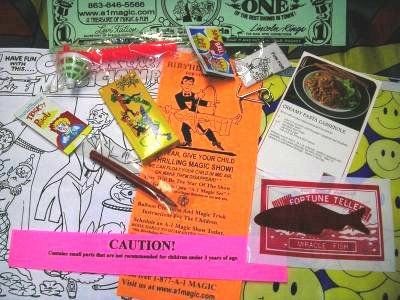 The loot bags have 5 little magic tricks, some magic instructions and some promotional material. It comes in a printed loot bag. We try to bring more bags than the number of guests expected, but you only pay for the exact number used. We have a "NO VIDEO RECORDING" policy at all of our magic shows due to use of copyright material. 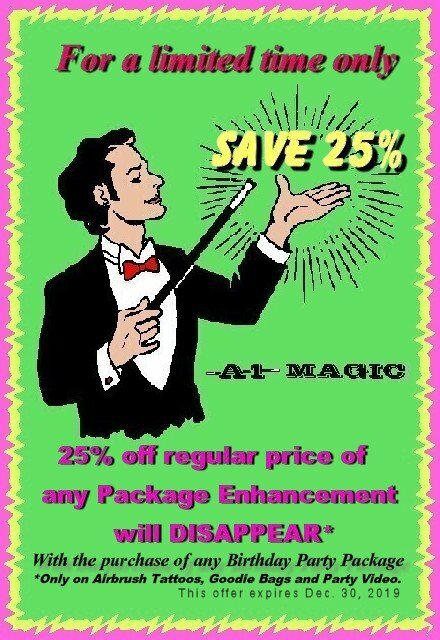 However, we can offer you a personalized DVD of your child's birthday magic show. We bring in the video cameras, set them up and tape the entire show from different angles. Then it is edited to comply with copyrights, add graphics, sub-titles, special effects, sound effects, etc. just like the big studios. The end result is a high quality production of a very special day in your child's life. I just want to inform you that the editing process is very lengthy and it may take a while before I have your DVD ready, depending on how many shows/projects I have in the waiting.